New South Wales government – Live In Our Skinz! In Victoria, Australia anyone 18-years-old and under are banned from tanning salons. Owners must display health warnings or face fines up to $1 million. Since the law in Victoria came into effect in 2008, the “number of outlets offering the service has plummeted by 67% from 436 to 143 salons.” Now the New South Wales government is announcing plans for a total ban on tanning salons by the end of 2014. With businesses closing and losing customers they are unloading their used tanning beds onto online shopping websites like Craigslist, Ebay and Amazon. This sets up a dangerous scenario where people can buy their own personal tanning bed with a click of a button and could lead to more cases of skin cancer as people tan without supervision. “Some of these beds are worth $15,000 to $20,000 and I’ve seen some online being sold for $500 or less. This is very powerful equipment and these commercial machines can do some damage if you don’t follow the rules. You’re going to get idiots who will use them all day and burn themselves silly,” Mr. Konemann (former head of the Australian Solarium Association) says. What are we going to do with thousands of tanning beds?? Is it the governments responsibility? Not only are there used tanning beds for sale online, but there are many websites that sell brand new ones too. Just like tanning salons these online retailers provide a lot of misinformation. I found the selling points sleazy, deceptive and astonishing. There was one sentence in particular that said, “If anything goes wrong with your new tanning bed you can rely on our customer service department to resolve any issue.” I wonder if they can resolve skin cancer, melanoma or the loss of a loved one as a result of tanning bed use? I doubt it. Just to clarify the above bullets are sugar-coated misinformation used to sell tanning beds. Tanning is a natural biochemical process that is a result of skin damage. A tan is caused when there is injury to the skin’s DNA from over exposure to UV rays. The skin darkens in an attempt to prevent further DNA damage. Another correction is that UVA is definitely a penetrating ray. It penetrates deeper than UVB rays (that cause reddening and sunburn) and is the dominate tanning ray that causes premature skin aging and wrinkling. The only truth spoken about tanning beds is that they emit more UVA rays which could be the reason why frequent tanning bed users are more likely to be diagnosed with squamous and basal cell carcinoma. 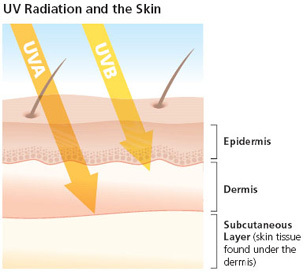 We know that UV rays are the primary environmental etiologic risk factor for skin cancer. That is the truth! Join the discussion on our Facebook page. I would love to hear what you think about the surplus of unwanted tanning beds. Should the governement control the sell of them. Should we destroy them? Do you think they could end up in landfills, and if so what would be the effect of that? “Like” us, Tweet with us and add UV Skinz to your Reader! UV Skinz uv-protective sunwear are stylish and carry a UPF rating of 50+, which blocks out over 98% of the sun’s harmful UV rays, protecting delicate skin from damaging sunburns. • Cost effective — UV Skinz swim shirts cost about the same as a couple bottles of sunscreen, but will last you for several seasons. • Dependable — Will not wash off, rub off, dissipate or expire. Fun in the Sun is so Tweet!